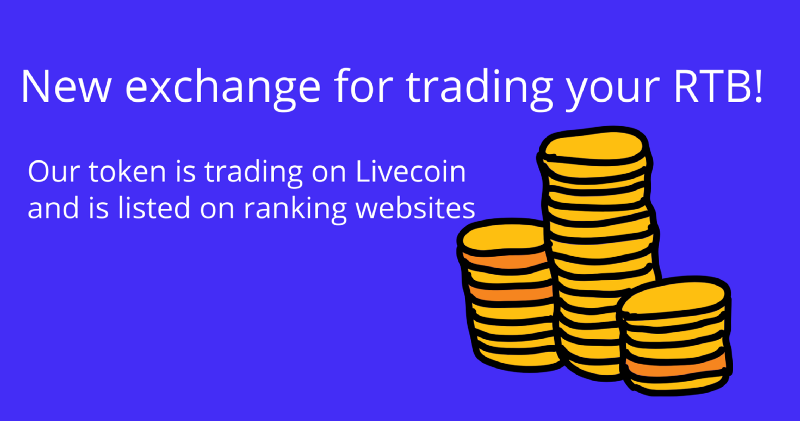 It is now possible to trade RTB/BTC currency pair as well as to take advantage of arbitrage opportunities between livecoin and IDEX. Very soon we will publish a how-to guide on how to trade RTB on Livecoin. Now we’re suggesting you to check out the tutorial video on how to trade on this exchange. You can also follow RTB on coingecko (14М+ monthly visits), worldcoinindex (7М+ monthly visits), coincodex (1M+ monthly visits) и coinranker (30K+ monthly visits). RTB is listed on cryptocompare, too — and the audience of this source is 15,6М users! RTB potential coverage composes now around 38M: this is the total number of the audience of all of the coin rankings where RTB is listed. We know that many of RTB holders expect our token to be listed on coinmarketcap. Only high volumes can bring it into reality so let’s strive for it together! We are planning to put RTB on other cryptocurrency exchanges in the nearest future. We remind you that RTB is trading on IDEX as well. You can find a how-to guide on how to trade RTB on IDEX in our blog.